Survival horror games shot into the limelight around the age of the Playstation in the US. Games like Resident Evil and Silent Hill brought the idea of being scared to death into the mainstream, so far as console video games were concerned. When you think of the Nintendo Entertainment System, you certainly don’t think of frightful or gory games right off the bat (and if you do, you certainly had a different childhood than I did). Uninvited was a game that I remember seeing some kind of advertisement for when I was younger but can’t for the life of me remember anything about except for the title. I remember also being afraid of the Friday the 13th game that I had, so I didn’t invest time into finding the game until my later years. When I finally did pick up Uninvited, I found some of the charm that I had expected mixed in with some Gothic horror dripping off of it. How is the game now that I’m old enough to hold my own against its terror? The game starts as you wake up in your crashed car, your memory hazy and your sister missing. When you find your way out of the car, you find yourself stranded in front of a large and imposing manor, no sign of your sibling anywhere. Once your car bursts into flames, it becomes apparent that you’ll have to find your sister (you were going to do that anyway, right?) and traverse the house to do so. The game is reminiscent of numerous games from around the time. So far as the interface is concerned, Kemco used the same type of interface with Shadowgate and Déjà Vu, two other point and click adventure games that somewhat fell under the radar over time. Everything is in first person, save for your death sequences, and you keep an inventory on the side of the screen that you can use throughout the game. Moving and other actions take place through a command list at the bottom of the screen, as well. The tone of the game is vaguely Lovecraftian, calling to mind games like Alone in the Dark and The 7th Guest, both wonderful, if not slightly clunky, PC games. Witchcraft, magic objects, and strange creatures that you can’t quite describe all appear throughout the game as you progress. It’s okay, though, as Nintendo of America censored out the pentagrams and an address that read ‘666’ as a part of it. They also changed your sibling from your younger brother to your older sister. That one’s a head scratcher. Another fun note is that this version of the game is actually the fourth iteration, the first being on the Mac in 1986. It went from computer to Famicom, and then over here. It’s brother-in-arms, Shadowgate, did the same thing. 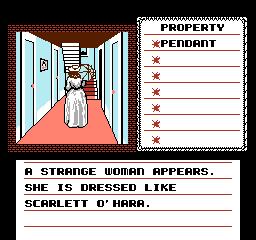 Much like Shadowgate and Déjà Vu, the game relies a bit on narrative, which was not something that happened often in the NES days. Descriptions of situation and objects can be somewhat jarring, which adds a nice touch to the gameplay. Also like those games, you have a huge inventory of items that you can pick up- and a sparse few that you actually need to get through the game. This certainly turns on the ol’ thinker for the player, and it makes the player wonder what all of these things are good for. So far as great things to say about the game, however, that paragraph roughly sums it up. The fact that so many items end up being useless throughout the game certainly does make you try different combinations and uses each time you pick up the game, but some of those ‘useless’ items can also lead to your death or seem perfectly logical for your adventure. Understandably, doing things like using an axe on a cabinet to open it may not work, as the puzzle will not use that as a fair end. Using some of the other items, however, makes you scratch your head as to why it won’t solve what you’re trying to do. Adding in the fact that you definitely need to examine every item you pick up to know their uses, and you wind up doubling the time of the game just by wanting to collect everything in case you need it. The time of the game tends to come to a crashing stop, though, as many strange things can cause you to perish. Some of these things are kind of creative. If you stay in your crashed car for too long, it explodes as it would if you were outside of it, killing you before you even start the plot of the game. Also, stupid things like using a knife on yourself will cause you to bleed to death. This issue is a mixed bag, though, as there are also things that will kill you with nonsense. One example is if you pick up a ruby, which seems important enough, it will cause you to get light-headed, delusional, and it will kill you eventually. There is no explanation of why this is happening or what is causing it, but plenty of my games ended abruptly because of that one item. Another puzzle has you confronted with three animals in a maze, and if you pick up the wrong one, they converge on you and eat you. Mind you, these animals are a hawk, a snake, and a cat (I believe it was a cat), not anything I would expect to devour me. Well, maybe the snake. Oh, and for goodness sake, take the cap off of the Ghost-Away before you try to use it. Presentation wise, the game has some quirks. The monsters, even the menacing ones, all look goofy and bring laughs in the middle of otherwise tense situations, and some of the perspectives in certain environments are a little off. The game seems to shine, though, in its death sequences, which probably explains why there are so many. The game is a bit too colorful in some parts to feel oppressively scary, but it works with the Nintendo and its general library. Again, the art seems to shine in darker places with grays and deep earth tones throughout. The music is droning, and it ruins the mood occasionally. Some of it was fine and creepy, but other tunes feel out of place, such as when you run into the southern belle or one of the creatures flails its way across your vision. It’s sometimes hard to tell if the game takes itself seriously, and the ‘score’ it puts forth only furthers that. In a game where atmosphere has to be everything, it felt like they could have tried harder. Even with the above gripes, I enjoyed the game for the hour or so I played it. I always have to admit my faults, though, and after trying to beat this game off and on for about three years, I got to the point where I just sat down with a walkthrough and plodded through it, which shaved off a lot of time. I have heard that was the same issue as Shadowgate from this company, but I do remember hammering through Déjà Vu with my best friend in third grade or so. I felt a little bit of a payoff when the game ended, but I knew it was a hollow victory. The game would not stand up nowadays, as I think most people would get irritated and quit after their twentieth or so death, and the tone of the game veers into the silly just a little too much. If you want a point and click game to travel through, I’d say to go through this for posterity’s sake, but you may want to check out games that take themselves more seriously (like Déjà Vu or Clock Tower) or know that they are silly games (Maniac Mansion).